Litigation to resolve claims regarding art and cultural artifacts can be extremely costly and time-consuming; for example, some cases spend years grappling with complex jurisdictional questions before a court can even begin to evaluate the merits of a claim. Moreover, regardless of their chances of prevailing in a lawsuit, people and institutions are often motivated by a desire to “do the right thing” (for both moral and publicity reasons) when it comes to claims that an artwork’s provenance is tainted by looting. It’s no wonder, then, that many parties who find themselves in such disputes wish to find a way to negotiate a voluntary return of the work to a deserving claimant. Several recent stories illustrate this growing trend, in cases involving high-profile collectors and institutions. Last year, we wrote about Christie’s executive François-Henri Pinault’s voluntary return of two priceless bronze sculptures to the National Museum of China. The works had allegedly been looted by British and French troops around 1860; more than 150 years later, their homecoming was celebrated in a ceremony in Tiananmen Square. 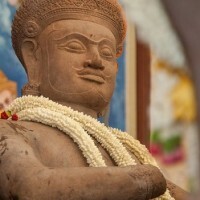 Just last week, Cambodian and American officials hailed the return of three 1,000-year-old statues depicting figures from Hindu myths. The works were part of a set of nine statutes allegedly looted from a temple during Cambodia’s civil war in the 1970s. One has been in the collection of the Norton Simon Museum in Pasadena, California since 1976; after what one report described as “months of discussions,” the museum agreed to return it “as a gesture of friendship, and in response to a unique and compelling request by top officials in Cambodia to help rebuild its ‘soul’ as a nation.” The second was consigned to Sotheby’s by the widow of a Belgian collector, but was pulled from a scheduled auction in 2011 due to Cambodia’s claims; the auction house ultimately agreed to return the statue as part of a settlement following litigation with the U.S. government on behalf of Cambodia. The third was sold in a Christie’s auction in 2009, but after Christie’s determined that the sculpture had been looted, the auction house bought it back from the “cooperative” purchaser and voluntarily paid to return it to its homeland. Cambodia’s secretary of state praised the auction house’s “very generous approach” during the “complex and costly” process of recovering and repatriating the work. Some observers have suggested that these repatriations represent a domino effect, prompted by last year’s decision by the New York Metropolitan Museum of Art to return two other Cambodian statues from the same temple. Behind the scenes of stories like these, there are tangles of legal issues. A person or institution in possession of a contested work, even a person or institution with the best of intentions, cannot simply “let it go” with a farewell and a handshake. Even when all parties are committed to avoiding litigation and reaching a fair outcome, legal advice is a necessity. The rights of third parties may be an important threshold consideration. For museums, donors may have placed legal restrictions on what the institution can and cannot do with donated works. Auction houses and dealers may owe legal obligations to their consignors. Jointly owned works or works held in trust may come with their own specific legal issues that must be dealt with before an agreement can be reached with the claimant. As between the returning entity and the receiving entity, legal counsel can help evaluate multiple options for structuring a voluntary return; for example, depending on the individual circumstances, structuring the transaction as a gift, a sale, a loan, or an exchange may carry pros, cons, and risks. The parties will need written agreements documenting not only fundamentals as releases of claims and transfer of title, but also practical considerations such as responsibility for insurance and shipping of the work to its new resting place. In cross-border situations, parties may need to manage issues ranging from import-export requirements to diplomatic and political implications. And given the public’s increasing interest in cultural property issues, all parties will need to consider how such a transaction may impact their public image; savvy legal counsel can help negotiate issues ranging from joint press statements to what kind of signage might be displayed along with the work in the future. Stories about successful voluntary repatriations—especially by such prominent institutions as the Met, Sotheby’s, and Christie’s—are creating momentum, precedent, and “positive peer pressure” that will hopefully encourage the art world to explore future repatriations of art and artifacts scattered across the globe. Sound legal advice can help pave the way for these types of homecomings.